Banks and financial institutions are (still, mostly) macho, testosterone-fuelled environments where making the quick buck trumps almost every other consideration. This attitude to money making – just looking at the immediate profit on a transaction – doesn’t maximize profits. In fact, unless we learn from the mistakes of the past and start focusing on more than short-term gains, our financial myopia could lead to losses, bankruptcies and market failures. In 2017, the masters of the universe have still not quite understood what these words mean, even though they are truer now than ever before. Central banks and governments haven’t controlled the volume of money in the economy for quite some time now. Instead, it has largely been dictated by private financial institutions. Today, in most developed economies, some 95% of the money in circulation is created by private financial institutions. This is not down to fraud, but thanks to the legitimate creation of wealth through investment and lending. It is a result of what is known as the multiplier effect. This is interesting, because it tells us something about both power and money. When financial institutions decide whether or not to invest or to lend, they literally make most of the money they are investing not as an individual institution, but as a consequence of our financial system. This gives them far more collective power over the economy – and therefore people’s lives – than if they were just lending money that already existed. But this oversized power has not been matched with equal measures of responsibility. Instead, financial institutions continue to react in a way that is short-termist and this creates instability. When financial liquidity is most needed, the supply of money is halted – banks stop lending during recessions because investments are less likely to make short-term gains. When money supply needs to be restrained because the economy is heading towards a bubble, the prospect of short-term gains pushes financial institutions to pump money into the economy. In effect financial institutions create real world economic instability by using models that only look minutes, days or, at best, months into the future. And it doesn’t even help the financial institutions, whose own economy is as affected by boom and bust as the real economy is. A consequence of this approach is the destruction of assets. Banks lend at preferential rates to those that can quickly turn a profit – even if the long-term potential of the business is not sustainable. A company that buys a forest and cuts it down can, of course, repay its loans faster than one that plants a new tree for each one it destroys. And, in the short term, it can pay better dividends. But once those trees are gone, you are left with no business and a wasteland. I’m hoping that some of the people reading this are financial experts who, unlike me, don’t work with sustainable finance. I have a simple message for you. 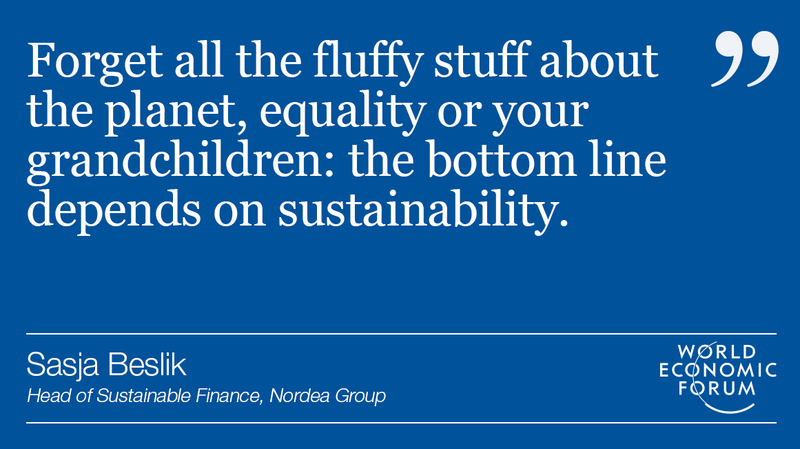 Forget all the fluffy stuff about the planet, equality or your grandchildren and consider this: the bottom line depends on sustainability. Understand that and you guarantee your own future. When we create money, we also decide how it is spent. Spending that money in a sustainable way is not about making less money – in fact, it’s quite the opposite. If we invest in businesses that take care of natural resources and help build local communities, we create revenue streams (and potential customers) that help us build our long-term profitability. If we take a longer view, we stop being scared of lending during a recession and in doing so we reduce the impact and duration of that same recession. If we work towards an economy that functions for everyone, it functions for us. What is the future of global finance?